Locks the zipper of your RoofBag carrier. Adds security and peace of mind. 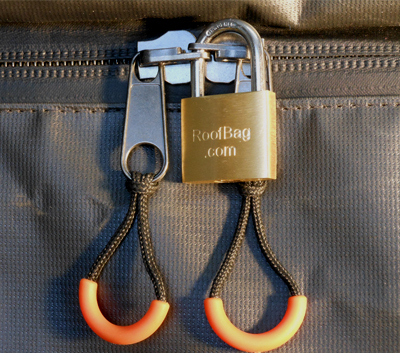 Secure the contents of your RoofBag carrier with this solid, rust-proof padlock. 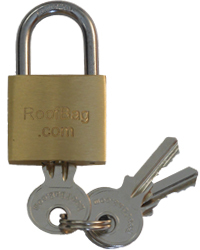 This high-quality, rust-proof, solid-brass lock allows you to securely lock the zipper of the RoofBag carrier. It gives you peace of mind when you have to leave the RoofBag carrier unattended, by securing the zipper, its most vulnerable point of entry. We have designed features into this lock with our RoofBag customers in mind. It attaches easily to the zipper slider holes, and with its 3 keys, it is forgiving if you ever lose one or even 2 of the keys. The RoofBag name is engraved on the keys so you never have to wonder what these keys are for. Solid brass means rust-proof, so this lock can get wet and you don't have to worry about its mechanism ever rusting or jamming. - Hardened steel shackle protects padlock against cutting. - Solid brass body and mechanism, makes this padlock rustproof, so it will never jam because of rust build-up. - 3 keys make it very unlikely that you won't be able to open the padlock because of lost keys.